Bar Grate. StainlessDrains.com manufactures grates for our drains along with Replacement grates to fit any need. We offer a variety of options such as perforated, bar, subway bar, perimeter gap, slotted, reinforced and custom logo grates. Grates are available in any Load Class A-F. If you don’t see a grate you’re looking for, let us know, custom is our specialty. Half Bar Grate. StainlessDrains.com manufactures grates for our drains along with Replacement grates to fit any need. We offer a variety of options such as perforated, bar, subway bar, perimeter gap, slotted, reinforced and custom logo grates. Grates are available in any Load Class A-F. If you don’t see a grate you’re looking for, let us know, custom is our specialty. Heavy Duty Bar Grate. StainlessDrains.com manufactures grates for our drains along with Replacement grates to fit any need. We offer a variety of options such as perforated, bar, subway bar, perimeter gap, slotted, reinforced and custom logo grates. Grates are available in any Load Class A-F. If you don’t see a grate you’re looking for, let us know, custom is our specialty. Subway Grate. StainlessDrains.com manufactures grates for our drains along with Replacement grates to fit any need. We offer a variety of options such as perforated, bar, subway bar, perimeter gap, slotted, reinforced and custom logo grates. Grates are available in any Load Class A-F. If you don’t see a grate you’re looking for, let us know, custom is our specialty. 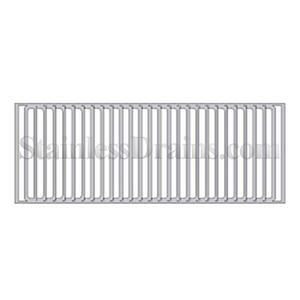 10 guage Slotted Anheuser Busch Grate, Class A. StainlessDrains.com manufactures grates for our drains along with Replacement grates to fit any need. We offer a variety of options such as perforated, bar, subway bar, perimeter gap, slotted, reinforced and custom logo grates. Grates are available in any Load Class A-F. If you don’t see a grate you’re looking for, let us know, custom is our specialty. Smooth Secured Cliff Bar Logo Grate, Class F. StainlessDrains.com manufactures grates for our drains along with Replacement grates to fit any need. We offer a variety of options such as perforated, bar, subway bar, perimeter gap, slotted, reinforced and custom logo grates. Grates are available in any Load Class A-F. If you don’t see a grate you’re looking for, let us know, custom is our specialty. 10 gauge Slotted Costco Logo Grate, Class A. StainlessDrains.com manufactures grates for our drains along with Replacement grates to fit any need. We offer a variety of options such as perforated, bar, subway bar, perimeter gap, slotted, reinforced and custom logo grates. 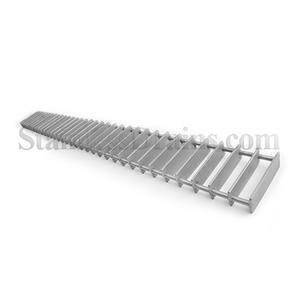 Grates are available in any Load Class A-F. If you don’t see a grate you’re looking for, let us know, custom is our specialty. 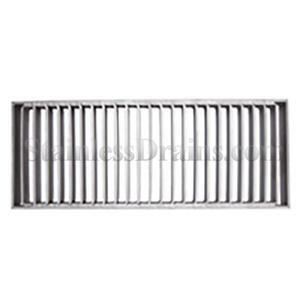 12 gauge Slotted Dean Foods Logo Grate, Class A. StainlessDrains.com manufactures grates for our drains along with Replacement grates to fit any need. We offer a variety of options such as perforated, bar, subway bar, perimeter gap, slotted, reinforced and custom logo grates. Grates are available in any Load Class A-F. If you don’t see a grate you’re looking for, let us know, custom is our specialty. 14 gauge Slotted Hershey's Logo Grate, Class A. StainlessDrains.com manufactures grates for our drains along with Replacement grates to fit any need. We offer a variety of options such as perforated, bar, subway bar, perimeter gap, slotted, reinforced and custom logo grates. Grates are available in any Load Class A-F. If you don’t see a grate you’re looking for, let us know, custom is our specialty. Perforated Google Logo Trench Grate. StainlessDrains.com manufactures grates for our drains along with Replacement grates to fit any need. We offer a variety of options such as perforated, bar, subway bar, perimeter gap, slotted, reinforced and custom logo grates. Grates are available in any Load Class A-F. If you don’t see a grate you’re looking for, let us know, custom is our specialty. 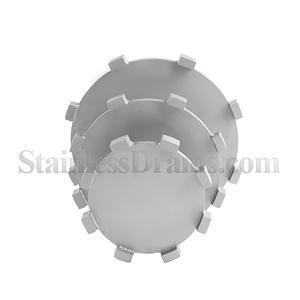 Sample Trench Drain Grate. StainlessDrains.com manufactures grates for our drains along with Replacement grates to fit any need. We offer a variety of options such as perforated, bar, subway bar, perimeter gap, slotted, reinforced and custom logo grates. Grates are available in any Load Class A-F. If you don’t see a grate you’re looking for, let us know, custom is our specialty. 12 gauge Slotted Nestle Logo Grate. StainlessDrains.com manufactures grates for our drains along with Replacement grates to fit any need. We offer a variety of options such as perforated, bar, subway bar, perimeter gap, slotted, reinforced and custom logo grates. Grates are available in any Load Class A-F. If you don’t see a grate you’re looking for, let us know, custom is our specialty. 10 gauge Slotted Pepsi Cola Logo Grate, Class A. StainlessDrains.com manufactures grates for our drains along with Replacement grates to fit any need. We offer a variety of options such as perforated, bar, subway bar, perimeter gap, slotted, reinforced and custom logo grates. Grates are available in any Load Class A-F. If you don’t see a grate you’re looking for, let us know, custom is our specialty. 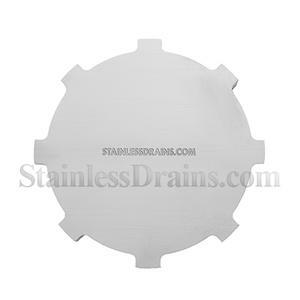 StainlessDrains.com Logo Grate. 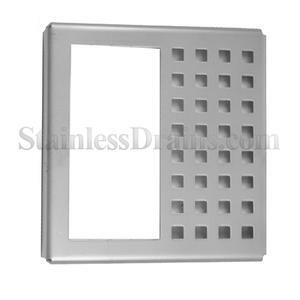 StainlessDrains.com manufactures grates for our drains along with Replacement grates to fit any need. We offer a variety of options such as perforated, bar, subway bar, perimeter gap, slotted, reinforced and custom logo grates. Grates are available in any Load Class A-F. If you don’t see a grate you’re looking for, let us know, custom is our specialty. Half Perforated Grate. StainlessDrains.com manufactures grates for our drains along with Replacement grates to fit any need. We offer a variety of options such as perforated, bar, subway bar, perimeter gap, slotted, reinforced and custom logo grates. Grates are available in any Load Class A-F. If you don’t see a grate you’re looking for, let us know, custom is our specialty. 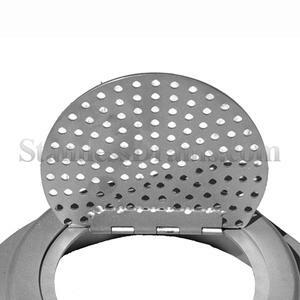 Perforated Hinged Grate for Down Spout. StainlessDrains.com manufactures grates for our drains along with Replacement grates to fit any need. We offer a variety of options such as perforated, bar, subway bar, perimeter gap, slotted, reinforced and custom logo grates. 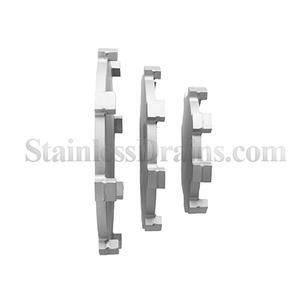 Grates are available in any Load Class A-F. If you don’t see a grate you’re looking for, let us know, custom is our specialty. 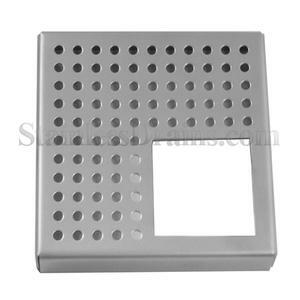 Quarterd Perforated Square Grate. StainlessDrains.com manufactures grates for our drains along with Replacement grates to fit any need. We offer a variety of options such as perforated, bar, subway bar, perimeter gap, slotted, reinforced and custom logo grates. Grates are available in any Load Class A-F. If you don’t see a grate you’re looking for, let us know, custom is our specialty. 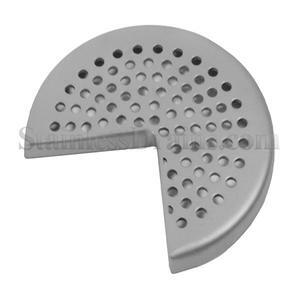 Quartered Round Perforated Grate. StainlessDrains.com manufactures grates for our drains along with Replacement grates to fit any need. We offer a variety of options such as perforated, bar, subway bar, perimeter gap, slotted, reinforced and custom logo grates. Grates are available in any Load Class A-F. If you don’t see a grate you’re looking for, let us know, custom is our specialty. 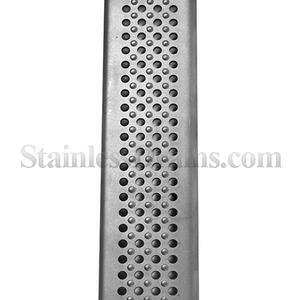 Raised Dimple Perforated Grate for Hemmed or Trench Drain. 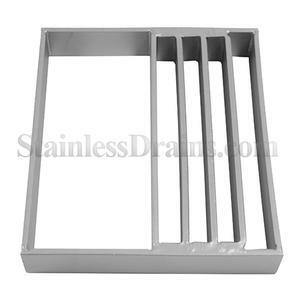 StainlessDrains.com manufactures grates for our drains along with Replacement grates to fit any need. We offer a variety of options such as perforated, bar, subway bar, perimeter gap, slotted, reinforced and custom logo grates. Grates are available in any Load Class A-F. If you don’t see a grate you’re looking for, let us know, custom is our specialty. 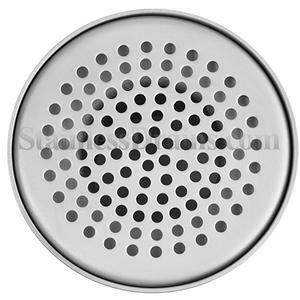 Round Perforated Grate, Class A. StainlessDrains.com manufactures grates for our drains along with Replacement grates to fit any need. We offer a variety of options such as perforated, bar, subway bar, perimeter gap, slotted, reinforced and custom logo grates. Grates are available in any Load Class A-F. If you don’t see a grate you’re looking for, let us know, custom is our specialty. Perimeter Gap Grates with Blocks, Extreme Heavy Duty, (Class E). StainlessDrains.com manufactures grates for our drains along with Replacement grates to fit any need. We offer a variety of options such as perforated, bar, subway bar, perimeter gap, slotted, reinforced and custom logo grates. Grates are available in any Load Class A-F. If you don’t see a grate you’re looking for, let us know, custom is our specialty. Perimeter Gap Grate, Extreme Heavy Duty, (Class E). 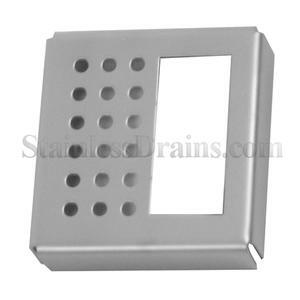 StainlessDrains.com manufactures grates for our drains along with Replacement grates to fit any need. We offer a variety of options such as perforated, bar, subway bar, perimeter gap, slotted, reinforced and custom logo grates. Grates are available in any Load Class A-F. If you don’t see a grate you’re looking for, let us know, custom is our specialty.